Take a peek beyond the beer you love to drink with our blog series titled, "Mug Shots." There are a lot of folks here at Boulder Beer who play a huge role in our day to day success. This is our way of introducing you to the team that makes it all happen. It’s time for you to meet our President and CEO, Jeff Brown! Jeff was born in Winter Haven, FL, which is about 30 miles South of Orlando and lived there until he was 12. His family then migrated to DeKalb, IL – which is best known as the town where barbed wire was invented, then at the age of 19 Jeff packed up and moved to Colorado Springs, CO to restart his career in the restaurant business. In 1980 Jeff moved up to Boulder, CO to open José Muldoon’s with Frank Day. “Having to select the beer list for the restaurant really got me interested in the beer scene, which wasn’t much of a scene back then.” Without question Jeff remembers the first time he had a Boulder Beer brew. “It was in 1980 on the patio of Old Chicago in Boulder and it was their Boulder Porter.” In 1991, Jeff came on board as General Manager of Boulder Beer Company and was then promoted to become President and CEO in 2002. Throughout his career Jeff always found time for his hobbies – Cycling (which he credits to both the brewery and his wife Michelle), spending time with his family, cooking, and going to some killer concerts. In a few short weeks Jeff is going to have more time on his hands, as he is retiring as President and CEO of Boulder Beer Co. Breweries and beer drinkers alike all know that the beer industry has changed over the years. Jeff likes to say that “the industry has matured. 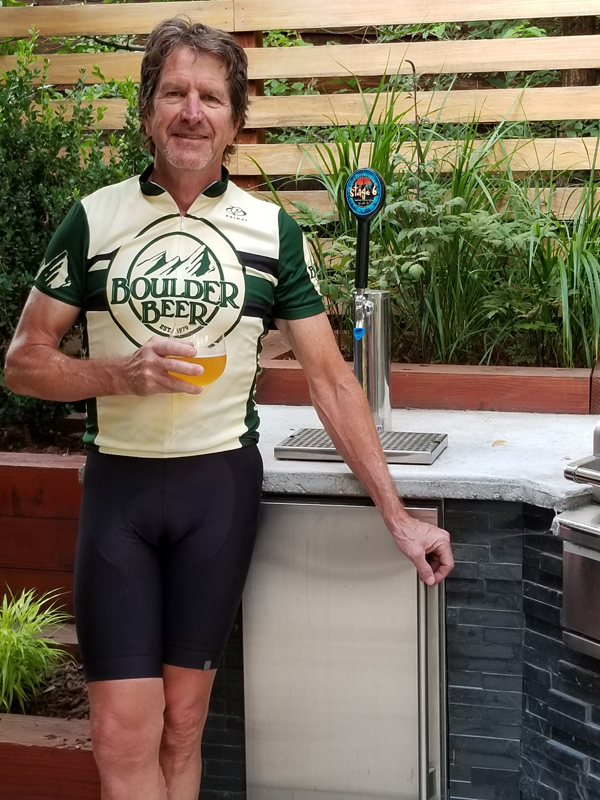 I went from knowing every brewer in the state to now not knowing every brewery in Boulder.” With almost 30 years in the brewing industry Jeff is not “quitting cold turkey,” he will retain a seat on Boulder Beer’s Board of Directors. One thing he will be sure doesn’t change are the Smoked Chicken Tacos and the Spicy Green Chili – beware, we aren’t lying when we say it’s spicy! “I plan on traveling with Michelle and Pancho (their beloved dog) in our converted Mercedes Sprinter van to places like the Sand Dunes, the Pacific Coast and Alaska.” When he’s not traveling you will probably find him with his 2 year old granddaughter Cora or cyclocross racing. “What I’m going to miss the most about the brewery is the people.” Don’t worry Jeff, there will always be a mug of Mojo with your name on it, so don’t be a stranger! The holiday parties and sponsoring the Telluride Bluegrass Festival will always be great memories for Jeff, but new memories are about to be made in his next chapter of life. The brewery will always remember Jeff as someone more than just a boss, he is a husband, a father, a mentor, and a friend to us all. We will miss you! Thanks Jeff, for all you’ve done! We appreciate you!